VATICAN CITY – God gave people the duty to take care of the earth, but they “often abuse creation and do not exercise” their responsibility to be stewards of nature, Pope Benedict XVI said. Citing the teaching of St. Gregory of Nyssa at his Aug. 29 weekly general audience, the pope condemned as criminal the suspected arson attacks that have hit parts of Europe. “I join those who rightly stigmatize such acts (as) criminal and invite everyone to pray for the victims of these tragedies,” he said. Greece was the hardest hit by wildfires that began Aug. 24 and killed at least 64 people. 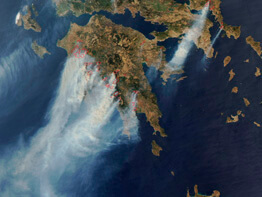 The government suspects many of this year’s blazes were started by arsonists because the number of major forest fires throughout Greece more than doubled from last year. Pope Benedict returned briefly to the Vatican from his papal summer villa at Castel Gandolfo for the weekly audience and talked about St. Gregory, the fourth-century bishop and doctor of the church. The pope told the estimated 12,000 people gathered in St. Peter’s Square that St. Gregory underlined how God molded human nature to be suitable for carrying out the responsibility of safeguarding creation. But in order to “truly exercise” this responsibility as stewards of nature, St. Gregory said humanity must cleanse itself of sin and be “penetrated by God and live in God’s light,” the pope noted. Life must not be wasted going after pointless or fruitless things, but rather should be spent searching for the divine light that helps humanity discern what is “truly useful,” good and true, he said. “This supreme good is found in Christianity,” which makes it possible for people “to imitate God, divine nature,” he added. But by purifying one’s heart and striving for holiness, people can wash away those impurities “and rediscover in ourselves God’s light” shining in all its divine beauty, he said.